Radical connectivity-our ability to connect instantly, constantly, and globally-is altering the exercise of power with dramatic speed and reshaping our biggest institutions. Governments, corporations, centers of knowledge, and expertise are eroding before the power of the individual. In some cases this is a positive development, but as Mele reveals, the promise of the Internet comes with a troubling downside. He asks: How do we trust information when journalists are replaced by bloggers, phone videos, and tweets? Will the collapse of two-party government bring us qualified leaders or demagogues and special-interest-controlled politicians? When web-based micro-businesses can out-compete major corporations, who enforces basic regulations-product safety, privacy protection, fraud, and tax collection? Unless we exercise deliberate moral choice over the design and use of technologies, Mele contends, we doom ourselves to a future that tramples human values, renders social structures chaotic, and destroys rather than enhances freedom. 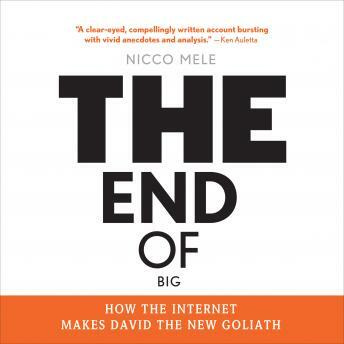 Both hopeful and alarming, thought-provoking and passionately-argued, The End of Big is an important book about our present-and our future. Interesting book, however the book is highly partisan in the political sense.